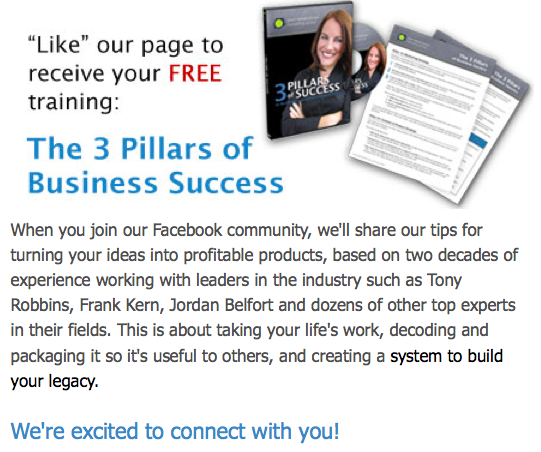 Are you looking to attract high-quality and loyal fans to your Facebook page? Without quality fans, your Facebook marketing efforts can fizzle out quickly. Keep reading to discover nine ways you can build loyal fans who’ll love your business. 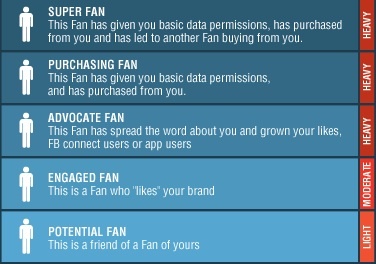 In a recently published infographic, Moontoast illustrates a Facebook fan’s journey from a “Potential Fan” all the way to a “Super Fan.” The image below shows a fan’s progression. Moontoast shows how a fan's level of interest with a brand can move from light to heavy engagement. Moontoast says Super Fans are Facebook users who have given you Insane Inflatable 5k access to their data via their Facebook profile, purchased from you and also encouraged another fan to purchase from you as well. There’s no doubt we all want an abundance of Super Fans! So how do you move a Potential Fan all the way up the ranks to Super Fan? For starters, it takes time. Facebook success rarely happens overnight and unless you are a huge brand like Zappos or Target, patience, persistence, and hustle are all required to create a successful Facebook page. There are also specific actions you can take to create a thriving Facebook page full of Super Fans. The following nine core strategies will help you streamline your Facebook activity and turn your Facebook page into a success story. The most successful companies on Facebook are those that step out from behind their logo and let the people behind the brand represent their Facebook page. The goal is to communicate with your fans as though you were talking to your friends, and let your personality come through in each post. One of the ways to do this is to step away from your niche once in a while and show your personal side through entertaining posts and photos. Change things up a bit and share details about your experiences and everyday life. Have you taken a fun trip recently? Post some pictures of your vacation to let your fans see a different side of you. Or maybe you see something funny while you’re out and about—share it! Snap a photo of it and post it to your wall with a fun caption. Guy Kawasaki, author of Enchantment, does this on a regular basis and his fans love it. The reason we are intrigued with Guy’s posts is because we get to see the real side of him, not just the author/expert side of Guy. When you visit Guy's Facebook page, you'll often find posts and photos that give you a peek at Guy's entertaining journeys outside of work. Quick Tip: Test out the 80/20 Rule. When posting to your Facebook page, 80% of the time focus on your business, and 20% of the time mix things up and show your fans and followers a different side of you—the personal side. Share with them photos and details of who you are outside of work. Remember, no one wants to do business with a brand; we all want to do business with real people! Always make sure that your content educates, entertains and empowers your fans to keep them engaged and coming back for more. The key to a successful content strategy is to consistently create new content and mix up your media often. For example, some of your fans might respond better to video than text, while others might be drawn to the images in your posts. To make sure you’re attracting the attention of your diverse group of fans, post your content in a variety of ways. iPhone Life Magazine does a great job of always showing fun images with each text post. Images and videos are the top two types of content that Facebook users gravitate to the most. One simple way to do this is mix up your blog posts by posting written blogs, video blogs and audio posts. Regularly drive traffic from your Facebook page to your blog to introduce your fans to a variety of content. Quick Tip: To keep your team on track, create an editorial calendar to track when you will post content, the type of content you plan to post and who’s responsible for content creation. Check out this post by Denise Wakeman for instructions on how to create an editorial calendar. Imagine this: You haven’t talked to your good friend in a while, so you call her up. When she answers the phone you say, “Hi! How’ve you been?” But before your friend can answer, you hang up the phone. That would be odd, right? Well, essentially that’s what you are doing each time you post a Facebook update and then instantly move on to a new task before waiting for a few fan responses so you can engage in a conversation. Make sure you never miss an opportunity to thank a fan for reaching out. Replying to your fans' posts shows them you really do care about what they have to say. Quick Tip: People love to talk about themselves, so craft your posts and questions around your fans to get them talking. Ask for your fans’ feedback, suggestions and solutions to challenges. You can learn a lot about your fans when you take the time to listen! Facebook gives brands the optimal opportunity to create genuine relationships with their prospects and customers. But it’s also a great platform for moving your fans to action. One of the best ways to move a Potential Fan to a Super Fan is to start out with simple calls to action. To do this, start out by posting valuable content, such as interesting articles and videos related to your niche, and accompany this content with simple calls to action such as “click this” or “watch this.” The valuable content will show your fans that you’re an authority and consistently post good stuff. Also, consider offering discounts and specials or ask your fans to sign up for your newsletter. These are all low-investment calls to action that will help you build trust and affinity over time. Zappos does a great job of mixing up their calls to action on their Facebook page. Some include value-added content as you can see above with the call to "CLICK PLAY" to participate in the live fashion Q&A video. Others are more promotional, such as "Click here to check out our new summer flip flops!" Quick Tip: Lead the way with free valuable content and later offer opportunities that require more of a commitment from your fans (such as giving their name and email in exchange for a giveaway or purchasing a product). Offering free webinars and teleseminars that provide training up front are great ways to promote your programs and services without having to sell too hard on your Facebook page. Studies have shown that social media users tend to trust their friends and peers more than they trust brands. It makes sense. If you were looking to try out a new restaurant, would you rather get a recommendation from a friend who just had a great meal or the restaurant that’s promoting its latest special? Word of mouth matters, especially on Facebook. To get your fans talking about you, the key is to make it easy to spread the word. One great way to do this is to create a contest or promotion that rewards fans for spreading the word. By using a platform such as Wildfire, you can track and reward the fans who invite their friends to join your contest. 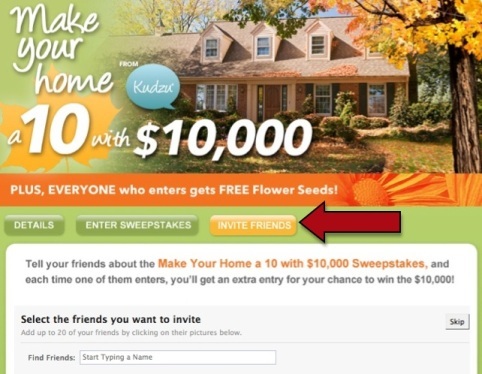 This sweepstakes by Kudzu promises extra chances to win for every friend you encourage to enter the contest. Quick Tip: Think of your ideal audience before you create a special promotion or campaign. What would get them excited to spread the word? When you make the experiences on your page about your fans rather than about your brand, your fans become more invested and engaged and in turn are more eager to tell their friends about you. Enhance your fans’ experience by creating a community that encourages your fans to interact with each other. One surefire way to do this is to spotlight your fans. When you create opportunities such as “fan of the week” or recognize top contributors, you are giving your fans an opportunity to get to know each other. Social Media Examiner regularly highlights a fan of the week on their Facebook page and always makes a point to link to their fans’ websites to give them free exposure. This generous gesture also allows fans to get to know the fan of the week even better. Quick Tip: To take this one step further, create a short and simple questionnaire that you send to your “fan of the week” in advance to learn a little more about him or her. When you highlight the fan, you can then include specific details that others will find interesting as well. You have multiple opportunities when it comes to branding your Facebook page. One option is to make your Facebook page an extension of your website to spark familiarity when your existing customers visit your page. Another option is to make it different from your own website so your fans experience a sense of exclusivity when they become a fan of your Facebook community. 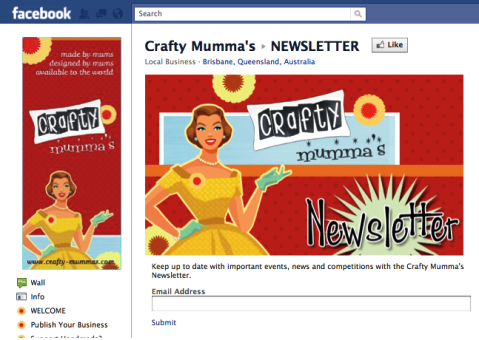 Crafty Mumma's Facebook page is a great example of smart branding. No matter if you want to create familiarity or a sense of exclusivity, it’s important to make your page dynamic and interesting so it will stand out from the rest. One way to do this is to create custom tabs that showcase your programs, products and services and tie in the look and feel of your brand. The key is to make it obvious who you are and what you’re about. Short videos that tell your fans about your business, mission statements and easily identifiable logos and images are great additions to a branded custom tab. Quick Tip: When creating your Facebook page, stay true to your brand and use the same colors, font style and images you use on your website to create a synergy between your page and your website. One of the most important questions to ask as you create your Facebook marketing plan is, “What do we want to achieve with our Facebook page and overall marketing on Facebook?” Often your Facebook vision will be closely aligned with your company’s vision. For example, let’s say you own a local running shoe store. Your vision for your retail store may be to sell the most high-tech, top-of-the-line running shoes and running gear to all the avid runners in your local community. As an extension of your company vision, your vision on Facebook may be to create a community of like-minded people who openly share their running stories and give each other support and advice. Over time your Facebook page becomes the ultimate hub for avid runners and you begin to attract runners from cities beyond your local community and you start to sell your top-of-the-line running shoes to people all over the world. Setting a clear vision can lead to lucrative opportunities. When you create a vision for your Facebook efforts, your actions are more deliberate and have purpose and your fans clearly understand what your page has to offer. If you’re just starting out developing your Facebook mission, one great place to start is with your fans’ expectations. What can your fans expect when they become a fan of your page? One optimal place to display expectations is on a custom welcome tab so all of your new fans will know what to expect before they start engaging on your wall. The following example is from the Facebook page of Pam Hendrickson Consulting. Notice how Pam tells her fans exactly what they can expect when they join her Facebook community. This is the first step in creating your Facebook vision. Quick Tip: It’s important that your entire team gets on board with your Facebook vision. One way to ensure this happens is to have a brainstorming session where everyone gets to contribute ideas for the larger vision for your page. From these ideas, create an internal Facebook mission—one that just you and your team will see—and refer to it often to make sure everyone is working toward the greater goal. With the rise of social media, your customers are now all social customers. They love to share, chat, post, Like and comment, and when they have something important to say (good, bad or worse), they are quick to share it on their social networks. Their comments run the gamut from the best raves to the worst rants. This is why monitoring is so essential to social media marketing. 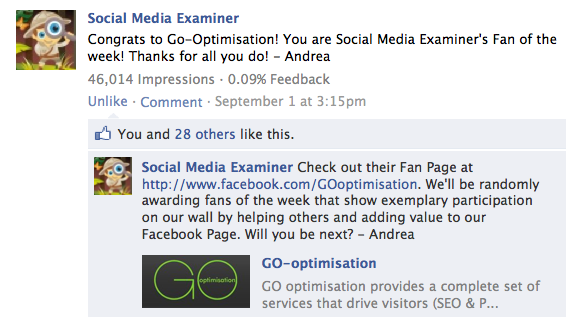 Social Media Examiner often gets great raves on their Facebook page. They monitor their page closely so they can respond to all comments. In addition to listening to your fans, you should also do a reality check to find out whether all of your social media activities are worth your time and effort. To make sure you’re on track, first you want to set your key performance indicators. What does success look like? What are the indicators of my success? How often will I check in to evaluate my progress? Once you answer these questions, make sure you have surefire methods in place that enable you to consistently track your Facebook marketing progress. The tools you choose will largely depend on the level of measuring and tracking your company needs. Most likely you’ll want to use a few different tools to get a clear picture of the overall activity on your Facebook page. If you’re new to social media analytics or are looking for a few new ideas to add to your tracking arsenal, consider these areas for monitoring and tracking. Quick Tip: The key here is to decide early on what you want to monitor, measure and track. You can tweak these as you start to gain momentum, but you must start somewhere to make sure you are staying on track. Now it’s your turn! Applying these nine strategies will help you sort through the many layers of Facebook marketing. If you’ve tested any of these strategies already or plan to do so in the near future, leave a comment in the box below and let us know.